Yesterday I listened to two sermons by a dead man! 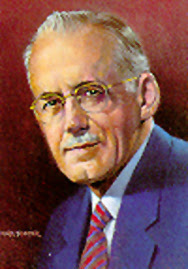 It seemed strange but I recently bought a book about A. W. Tozer which included a CD with two of his messages on it. I never had the privilege of hearing the modern-day prophet (in the truest sense) but have certainly read much of his work. I was surprised to discover that he wasn't as skilled an orator as I expected but he certainly left no stone unturned when "speaking the truth in love". "You can have this confidence in God, and you can have this respect for His will. Do not expect God to perform miracles for you so you can write books about them. Do not ever be caught asking God to send you toys like that to play around with. But if you are in trouble and concerned about your situation and willing to be honest with God, you can have confidence in Him. You can go to Him in the merit of His Son, claiming His promises, and He will not let you down. God will help you, and you will find the way of deliverance. God will move heaven and earth for you if you will trust Him." Trust Him today, dear friends! He is trustworthy and you can have...confidence in Him. You can download them and put them on cd.